The ring is timeless and has a classic center stone in a conic setting, with a small movable diamond on the side. The moveable setting makes the ring appear slightly different each time you look at it; it makes it remarkable because just like the person wearing it, always energetic and in motion, the ring is never in the same position. The rings are made of 18 kt. gold. 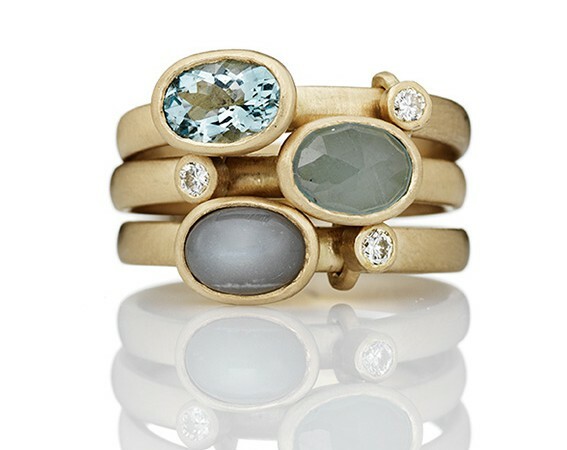 And has tree different gemstones, moonstone, green beryl and aquarmarin. All tree rings have a moveable 0.04 ct twvvs brilliant cut diamond on the side.